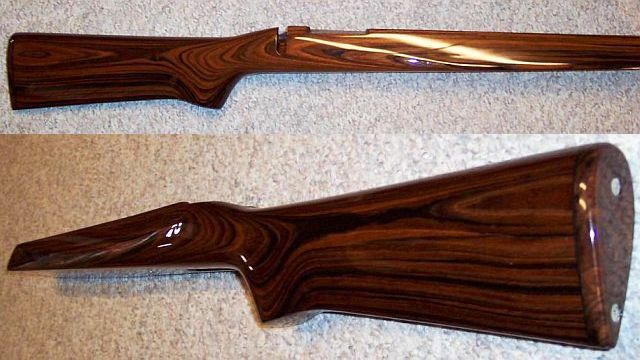 Mike's Comment: Here's a Viper in a SG&Y Benchrest stock. It has a black base, topped by silver marble with fading candy coats. Work from dark to light when applying the candy coats--blue, red, then yellow. Plan ahead on where you want the transitions. Comment: This is a Stockade Long-Range BR stock. I applied tangerine candy over a silver metallic base. Anytime one works with candies the base coats are critical as the candies are semi-transparent and show all the flaws underneath. Comment: This is a layered finish combining black base, then silver marble, followed by apple red candy coat on top. The silver marble shows through as red through the candy coat. By manipulation of the House of Kolor Marblizer you can vary the amount of color. Comment: Here are two views of a Shehane ST-BR in Obeche laminate. I wanted a finished look resembling fine walnut. Initial applications of high build clear were followed by a final application of a "flow" clear to ensure all the wood grain is filled. Careful sanding and buffing result in a perfect finish for your laminate stock. Comment: This is my own Ruger 10/22 with a Fajen Aristocrat stock. A black base coat was applied over the Fajen laminated wood, then the graphics are masked. Silver metallic is applied and the graphics removed. A red candy coat was the finishing touch, giving a candy-apple-red primary color with black cherry graphics. Comment: Here are two Shehane Trackers, thumbhole version on top and standard Rutland laminate below. With proper application, wood stocks can be given either painted or clear finishes. The key is to use the right products to ensure a proper finish. Wood stocks are given epoxy primer coats and sanded to fill the grain. A high-build clear is used to fill the grain on a stock that is clear-coated only, with no color layers. Comment: This is a Borden-style benchrest stock with multiple fading colors. Here I have a spectrum of candy colors over silver marble. This one has almost 100% coverage of silver marble leaving very little of the black base showing through. Comment: This was an Anschutz factory wood stock. Many people really like the red/black tiger-stripe effect. The stripes were done with a black base topped by airbrushed white highlights. Then a red candy was applied which changed the white highlights to red stripes. Comment: Here's an example of clear-coat over a McMillan factory marble gelcoat finish. The only preparation is a wet sanding with 400 grit. However, any flaws in the gelcoat will show through. You can use epoxy to fill any pin holes prior to clear-coating. Comment: Here are a pair of clear-coated Shehane Tracker IIs. Some wood absorbs the clear more readily and you will need more coats. You will run across some porous seams between the laminations also. I simply apply a couple of drops of clear directly on the seam to fill the void and sand carefully to fill the pinholes. Comment: This is a fiberglass benchrest stock that was finished in a manner similar to the Anschutz above. Over a black base, I air-brushed white highlights. Then a blue candy was applied, making the highlights blue. To achieve this effect on a glue-in stock, you need to mask carefully. After painting, pull the tape carefully, at right angles to the work, to avoid lifting the paint. Comment: This is XP bolt-action pistol stock with multi-color fades and marble effect. That's a lot of work for a small stock. I used an air-brush to apply the paint on the surfaces in the trigger guard and right behind the grip. If you use a larger gun you will not have the control to get into these small areas. All stock prep and paint work done by Mike Ricklefs. You can see more examples of Mike's work (including shotgun stocks) at www.MikeRicklefs.com. Photos Copyright © 2006 Mike Ricklefs, used by permission, All Rights Reserved.